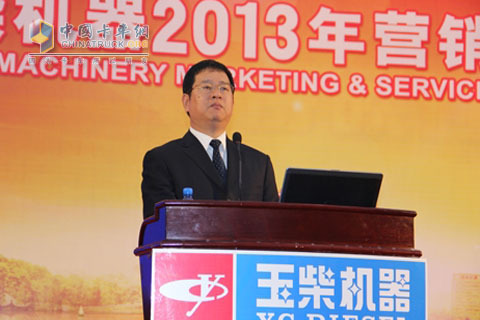 On January 15, 2013, Guangxi Yuchai Machinery Co., Ltd. 2013 Marketing Service Conference was held in Hangzhou. The theme of the conference was "breakthrough first, win-win cooperation". A total of thousands of Yuchai Service Station representatives from all over the country came to the conference. Wu Qiwei, general manager of Yuchai Machinery, deputy general managers Wang Limin, Zhong Yuwei, assistant general manager Gao Qiang and other senior managers of Yuchai attended the business conference and presented awards to outstanding service stations. At a time when China's economy was at a low point and the macroeconomic economy was stabilizing and picking up, the convening of this meeting has very important guiding significance for Yuchai's marketing and service system. According to Wang Limin, deputy general manager of Yuchai Machinery, in 2012, due to the impact of the downturn in the macroeconomic environment, Yuchai's machinery sold a total of 435,000 units of various types of engines, a year-on-year decrease of 15%, but the market share has increased. In 2013, the macro economy still faces many uncertainties. On the one hand, although the growth rate of GDP is expected to remain above 7.5%, inflationary pressures are still on the rise, the debt crisis in Europe continues, the international economic environment is complex and changeable, and export growth is weak. At the same time, the 4 trillion investment in 2008 entered the peak of debt repayment in 2013, the risk of bad debts gradually revealed, and the business environment of the company is still severe. "After the change of government in 2013, economic stimulus policies will be issued one after another. The economic growth for the whole year is expected to show a low and high trend," Wang Limin said. Based on this, Yuchaiâ€™s machinery has presented challenging production and sales targets: Strive for 470,000 units and challenge 490,000 units. Of these, 230,000 are powered by trucks, 130,000 by buses, 10,000 by passenger cars, 90,000 by power, and 30,000 by ship. In order to cooperate with the marketing work, Yuchai is fully prepared for services and product development. According to Zhong Yuwei, deputy general manager of Yuchai Machinery, the emission upgrade will be the main theme of this year's industry. Since January 1, 2013, the State V emissions regulations for gas engines have been implemented. From July 1st onwards, the national IV emission standards for heavy-duty diesel engines will also be implemented. . "The upgrade of emission regulations will seriously affect the commercial vehicle market this year. Yuchai will do its best to improve product preparation and service capabilities." Zhong Yuwei stated that â€œsegmenting markets, subdividing products, and pursuing professionalism and efficiencyâ€ will be Yuchaiâ€™s long-term strategy and brand positioning. In 2013, Yuchaiâ€™s power in trucks, buses and school buses, mining dump trucks, and gas engines The product layout of various market segments, such as new energy power, passenger car power, etc., has basically been completed. The next step is to continuously subdivide the products and models to achieve the leading applicability in various market segments. Taking the automotive engine as an example, with the forthcoming implementation of the diesel engine's four national standards, Yuchai has already formed 12.2L of 6K, 10.3L of 6MK, 8.4L of 6L, 7.26L of 6A, 6.5L of 6J, and 4.73L of 4EG. , 4.26L of 4E, 4.2L of 4D, 3.8L of 4S, 3.0L of 4FA, and 2.6L of 4Q are the eleven product platforms and have developed Common Rail+SCR, Common Rail+EGR+DOC+POC, Electronically controlled monomer pump + SCR, electronically controlled monomer pump + EGR + DOC + POC and other different national technical routes, can fully meet the upgrade of emission standards and various user needs. Wu Qiwei, General Manager of Yuchai Machinery, summed up the speech and said that the diesel engine country's upgrading of the country's four countries and the gas engine country's four upgrading country's are both challenges and opportunities, which means Yuchai will have more opportunities to expand. Chai has a greater chance to enter the relatively weak sub-sectors such as China Light-duty Trucks. â€œOur proposed goal of 490,000 units is to be the first to cross the threshold of 500,000 units in the industry. To this end, we have put forward 10 special targets, hoping to achieve the specific goals and overcome the shortcomings. Boards and inadequacies, seeking greater breakthroughs." It is understood that in these special marketing objectives, Yuchai's hybrid power system should reach 2,000 sets, 30,000 gas powered passenger cars, 12,000 large passengers for highways, 100,000 for road trucks, and 10,000 for trucks. The trucks have 40,000 sets of electric power, 5000 sets of mining vehicles and 50,000 sets of engines for overseas markets.